There are thousands of different animal wildlife species in America, ranging from the cute to the, well, not so cute. There is also an impressive 30,000 national parks, state parks, and nature reserves spread across the United States. Each offers a chance to see some of the rarest and most interesting animals in the nation. With so many places to from which to choose, it can be hard for animal lovers to pick the best spots to visit. Let’s take a trip across the country and find the best destinations to discover America’s stunning wildlife. Denali is not just one of the best parks in the country, but in the entire world. It has an unbeatable combination of untouched landscape and wildlife. Denali is one of the few places in the country where you can spot 4 out of “America’s Big 5" – moose, caribou, gray wolves, and grizzlies. If viewing these animals are on your bucket list, you are in luck because all reside in this gigantic national park. Denali’s approach is a little different than other national parks. There are no hiking trails or paved roads in the park. Instead, as soon as you set foot into Denali, you are paving your own path through the wilderness and chancing close encounters with America's most spectacular animals. For those a little timid at the thought of rounding a corner and coming face-to-face with a Grizzly, there’s another option to see wildlife in Denali – a bus tour along the park’s one dirt road. It twists and turns, winding its way up over 90 miles of hills and mountains. The wildlife in Denali is so abundant that within a couple of hours on the bus, you’ll have a good chance of glimpsing most of it up close. On my last bus journey through Denali, a massive grizzly blocked the road for ten minutes and refused to let us pass. Between Tennessee and North Carolina lies the Great Smoky Mountains National Park. The forest-covered park offers fantastic opportunities to discover wildlife. This gorgeous slice of America is home to over 1,500 black bears – the most extensive population in the lower 48 states. Because of the park’s dense forest, your best opportunity for American wildlife spotting will be in open areas like Cades Cove. The Cove is the most popular spot in the park for seeing everything from whitetail deer and elk to black bears. The park also has several scenic drives for spotting wildlife. Yellowstone has a massive variety of wildlife. 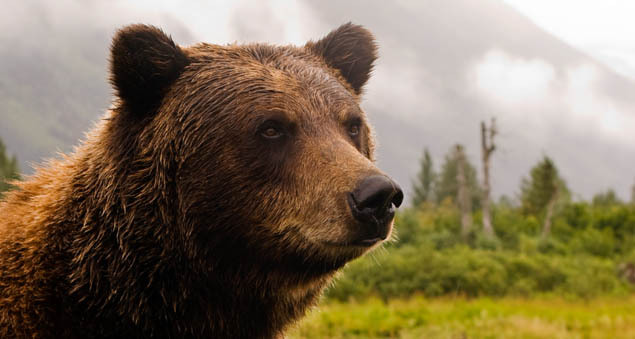 The park is home to wolves, bears, moose, elk, badgers, otters, foxes, wolverines, and lynx. However, the real star of the park's wildlife is the bison. These mammoth creatures can grow as tall as 6 feet and weigh as much as 2,000 pounds. Yellowstone has been home to the bison for thousands of years. Today, over 5,000 live in the park. This is an incredible achievement considering that in the late 1800’s, the bison population of North America had been hunted down to a size of only a few hundred. Bison carry a strong yet graceful presence and watching a herd roam the wilderness is an image you won’t soon forget. Bird’s watchers will want to head to the lower Rio Grande for an unforgettable birding experience. America is home to over 800 species of birds, and you can see as many as 500 of them at this national wildlife refuge. A few of the most famous birds include many types of herons, kingfishers, spoonbills, and cranes. The five islands of this national park lie off the coast of Southern California. They were isolated for over a thousand years and are now home to a unique natural habitat. Because of this, the Channel Islands National Park has a few species of wildlife that cannot be found anywhere else in the entire world. A few of the important animals to see in the park are the Channel Island fox, sea otters, whales, dolphins, and bald eagles. The unique mix of these disturbed islands makes it a get place to glimpse some of the rarest wildlife in the country. Reaching high into the clouds, spanning the great forest and prairies, and sinking into the depths of the green valleys, wildlife in America fill the nation with one of the most distinctive group of animals found anywhere on the planet. Exploring and enjoying all that the untouched landscape has to offer should be on everyone’s list and why not get started now. This list promises the best wildlife experiences to have when traveling around America.